Nordic Games and Gunfire Games are bringing Darksiders II: Deathinitive Edition to PlayStation 4 and Xbox One this Winter. It features all DLCs, improved graphics, native 1080p and more. Get the screens and details inside. 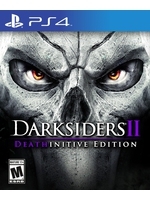 Nordic Games today announced that the Darksiders 2 Deathinitive Edition will come to current-gen consoles this winter. Just looks like the PC version. Which still runs fine on my 6 year old laptop. Sweet deal babby! Bad game is bad. Kill it with fire! Well, we obviously have differing opinions on this as i enjoyed bpth games a fair bit. Still, why they'd want to port it to PS4 i don't get. Everyone and their grandmas must have played it by now. the 360 version is like $5 at gamestop, have at it if you were under a rock or age at the time. Also, ease up on the Estus megido j/k.